The retro house, our new family home, has gone under some serious transformation since we laid hands on it (hopefully for the better!) To see what it looked like before we started you can see it here. Floor to ceiling subway tiles are generally not a modern look however by using a grey grout instead of white, it made it look a lot more contemporary. 1 - Tried to minimise what plumbing had to be moved. 2 - Did the demolition, tiling, made the mirror and painted the room ourselves. 3 - Purchased a cheap bath, vanity basin and wall tiles but spent a lot more on the "wow factor" items like custom made vanity, tap-ware, toilet (as it was smack bang in the middle of the room and one of the first things you see when you walk in the door) and floor tiles. Roger made this gorgeous mirror frame from Tas oak and stained it with Feast Watson Black Japan stain before putting in a $50 mirror from Bunnings Hardware. A bargain mirror for approx $100 but it has serious style. The vanity, although custom made/designed was actually cheaper than the ones I saw at Reece pluming and much nicer. It's Tas Oak timber veneer and I've had it made almost like a mini retro sideboard. I priced up stand alone baths and honestly, for the amount of time I ever actually have a bath (nearly never), I couldn't justify the price. Alternatively I chose this bath which still had lovely shape but was a fraction of the price of at $400. I think it still has wow factor and it's easier to clean behind! Instead of a boring chrome hook for the back of the door, I found this Oak knob instead. On my Tas Oak veneer doors, I think the knob looks perfect. A simple shower with only the glass wall to keep the splashes in. I love the big shower head but with the option of using the hand held too. This is the view when you walk into the room. I really wanted the vanity to be the first thing you saw but the configuration of the bathroom didn't allow for it. I still think it's pretty stunning though. It's certainly a whole lot better than it was! This new look is really way too far from what it looks like before. Seeing this kind of result will really make you feel that all your efforts were worth it. And I think you felt even more as you did most of the work in here. Cheers! 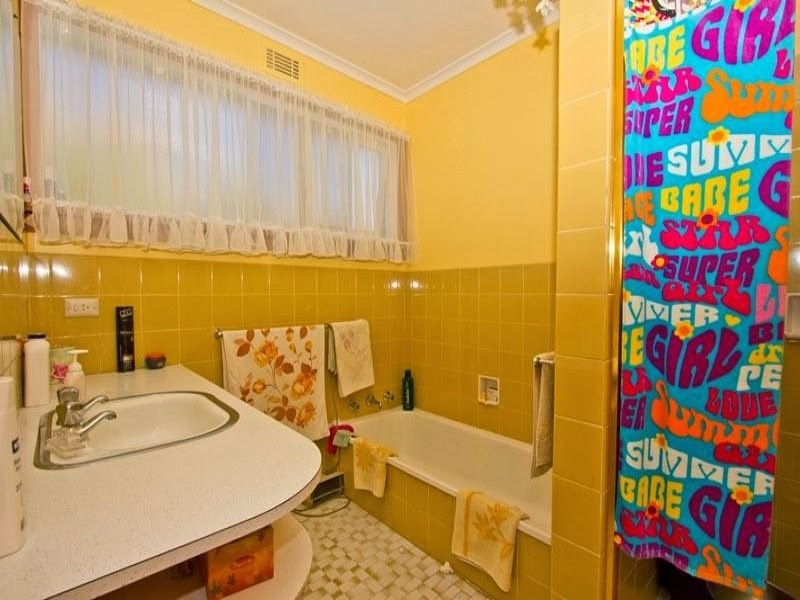 Your bathroom looks really great! I am also wanting to do my bathroom with white subway great grout. Do you remember which colour grout you used. Was is a dark or mid-tone grey? Stil trying to decide and yours looks great! Hello, wondering which company you used to make the vanity?